Lisa Grossman had never felt so "giddy with excitement" to hear her phone ring. The ring, as she recently described it in New Scientist magazine, where she works as a reporter, sounded like "a tinny version of the Christmas carol 'Angels We Have Heard on High.'" But no matter. The ring came from a cellphone she'd built herself, by hand, in an afternoon. "I felt like a wizard," Grossman told ABCNews.com. "I spent most of that day soldering," fusing minuscule components, about 60 of them, to a circuit board with molten metal filler. "I had never soldered anything before, and only had a vague idea of how it worked." That made her the perfect candidate for David Mellis, a graduate student in the MIT Media Lab's High-Low Tech group -- part of whose mission is to "democratize engineering"-- as he walked her through the steps. "He just had a little plastic bag, and dumped all these tiny, tiny parts on the table in front of me, and said here you go," Grossman said. "Here's how you hold the iron so that you don't melt what you don't mean to melt and burn yourself. "I did burn myself a couple of times," she said, "but I felt it was battle scars." Mellis, who designed the circuit board and created the downloadable software for the Do-It-Yourself Cellphone, had been a co-founder of Arduino, a company known for its simple, open-source circuit boards and microcontrollers. Popular with electronic hobbyists and hackers, they're hardly for everyone. Looking to extend the do-it-yourself electronics concept to nontechies such as Grossman, who said she'd never built anything before, Mellis set about designing consumer products that wouldn't require an engineering or computer science degree to make. "It's about giving people the idea that the consumer electronics we use are things that you can open up and make yourself and understand how they work and change how they work," he told ABCNews.com. He started with radios, moved on to portable speakers and computer mice with 3-D printed cases before tackling the ultimate object of neurotic fixation: the cellphone. "It is the ultimate device. We use them constantly, and we have these complex relationships with them, but they are technically more challenging," Mellis explained, speaking from his own DIY Cellphone without a scratch of static in the background. Grossman said, "He showed me the logic layout. Here's how all the little pieces talk to each other. And here's which connections have to be made between which parts. The soldering was a bit like doing color by numbers: That part goes here, that part goes there. "And there were parts where he was like, Make sure you don't solder those two legs together, because that will make things talk to each other that shouldn't talk to each other." And many of the parts "are just so small," Mellis said. Especially tricky to solder is the microcontroller. "It's like a bug about the size of a penny -- maybe five-eighths of an inch, but it has 11 legs on each side, and each leg is like about a 10th of an inch," he said. While the DIY Cellphone currently lives primarily in the lab, almost all of its parts can be bought online from websites that sell electronic components, Mellis said, while the instructions and source code can be downloaded from GitHub. The GSM module, which does most of the processing -- talking to the network, handling the audio -- comes from an e-commerce site in China. But buying the parts and assembling the phone might not yet be a task for casual tinkerers working alone at home. "Things did not always go as expected," Grossman said. "The first time I went through it I had the button for the No. 8 key on the dial pad rotated 90 degrees. So we plugged it in and turned it on and were pushing the buttons and none of the other buttons would work, because the No. 8 button was pressed all the time it was rotated, and you can only press one button at a time." And that wasn't all. When Grossman began to laser-cut the wood for the case, it caught fire. "We used the wrong wood, and it burned too easily," she said. The result of an afternoon's work was a phone that looked downright artisanal, "like a brick of wood with some buttons on it," Grossman said, "but I love it." The phone makes and receives calls, sends and receives texts, and includes a phone book that stores a few hundred numbers, a clock, call logs and a rechargeable battery, all for a cost of about $120 in parts and the price of a SIM card, which can range from $1 to $30. With its retro antenna and 84-by-48 monochrome pixel display screen, it's reminiscent of the Nokia phones, circa 2003. 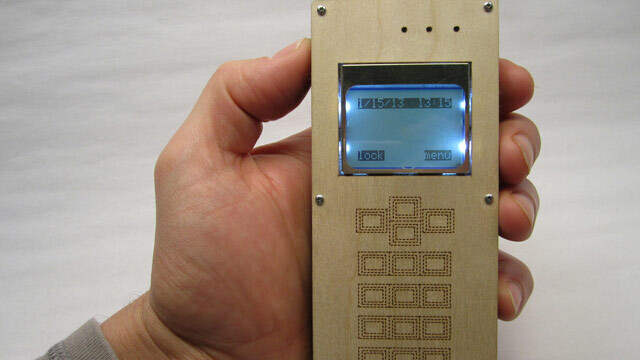 Now in its second prototype (the first version could only make and receive calls), the DIY Cellphone is likely to remain lab-bound for at least the next year. "I want to get it out to more people," Mellis said. He envisions the possibly of a kit, "where you solder it yourself, or something where the basic stuff is already soldered together for you and you can add features. That might be a little more creative. You can add on whatever you want instead of just soldering this thing." He's hoping to work with Arduino, the open source hardware and software developer that he helped launch in 2005, or possibly SparkFun Electronics, to develop a kit that could be commercially released. "Both companies make similar sorts of products for various audiences," Mellis said. But the DIY Cellphone might have a rough ride in a market caught up in more power, more features and bigger screens. "It sounds much more like an educational opportunity than a commercial one," said Charles Golvin, a principal wireless analyst at Forrester Research. "The mass audience of people when it comes to their phones want something that's delivering all the latest capabilities and access to a wide range of applications. "It's in the same spirit of turning cellular connectivity, together with the processing and graphics and other things, into a tool that somebody could use to hack together some wacky design." Mellis said he had to walk a balance between creating a phone that could do everything and keeping it simple enough so people could build it themselves. He said he uses his DIY Cellphone every day as his main phone and has repurposed his old iPhone to listen to podcasts at home. "I'm kind of enjoying not having to deal with email all the time," he said. Grossman said she's now thinking of changing the wooden case on her homegrown phone to clear resin, "so that you can see the guts." Much as she loves her DIY phone, she has no plans to give up her Android smartphone. "It's mostly for the apps," she said. "I get lost."